Friday November 25th, Saturday November 26th, & Sunday November 27th! 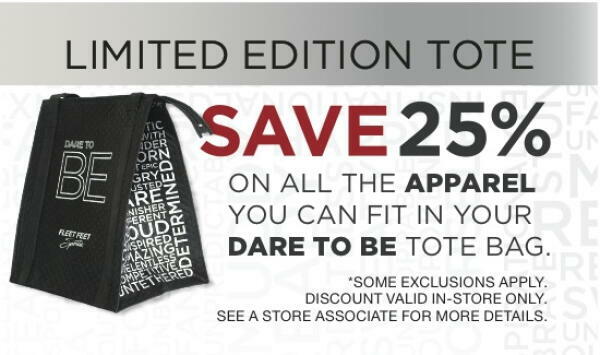 We have reached our limit of pre-orders for the Dare To Be tote bags! For those who have already reserved their tote bag, you will receive an email with all the information you need the sale! You still have an opportunity to get a bag! Stop by either store to buy a bag on the spot! We only have a few left so make sure to act fast! If you missed out on the tote bag deal, make sure to stop by on Black Friday morning for your chance to win a gift certificate! For the entire Fitnatic Weekend (while supplies last) we will have a Special Fleet Feet Fitnatic Edition Under Armour hoodie on sale for $40, and fancy discounted Fleet Feet Garmin Forerunner 235 GPS Watch!